Obituary for Rev. 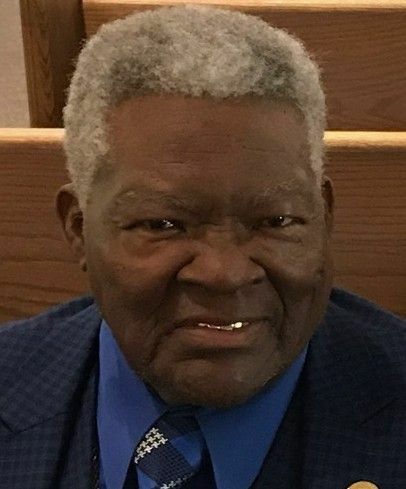 James White, Jr. | Jones Clark Funeral Home, Inc.
Rev. James White, Jr., age 85, passed from this life on Sunday, January 27, 2019 at approximately 5:09 p.m. at St. Rita’s Medical Center. He was born on June 13, 1933 in Pickens, Mississippi to the union of James and Martha J. (Freeman) White, Sr.; both parents preceded him in death. On July 2, 1953 he was united in holy matrimony to Carline (Malone) White, she survives in Lima. Rev. white retried from General Motors Corporation after over 37 years of service. He was a member of Fourth Street Missionary Baptist Church where he was an associate minister. He was a member of the U.A.W. Local 211, Master Mason of Samuel W. Clark Lodge 67, Miami Valley Consistory, and a Life Member of NAACP. He was an avid Ohio State Buckeye Fan and he loved to fish. WI. 17 grandchildren, 15 great grandchildren and 1 great-great-grandchild. 4 sisters; Mary L. Howard of Lexington, Miss. Ella Lacy (Pete) and Martha L. Griffin both of Pickens, Miss. Evelyn Cox (John) of Chicago, IL. He was preceded in death by 2 brothers; William White and Johnnie White. 2 sisters; Sallie M. Cox and Zelpha Flowers. Home Going Services will be held Saturday, February 9, 2019 at 10:00 a.m. at Philippian Missionary Baptist Church with Pastor Nathan Madison, officiating and Pastor Lorenzo White, eulogizing. Visitation/Wake will be held on Friday, February 8, 2019 at 4:00 p.m. until 8:00 p.m. with the family present from 6:00 p.m. to 8:00 p.m. at Second Baptist Church. Masonic Rites will be performed at 7:00 p.m.